St Mary’s College swiftly avenged last week’s home defeat to Buccaneers when they overcame the midlanders 22-6 in the Ulster Bank League Division 1A match played at Dubarry Park on Saturday. The Dublin side, bolstered by the return of Ireland Sevens player Terry Kennedy at full-back and the restoration of fit again Sean Kearns to fly-half, were the better outfit for the majority of this contest. 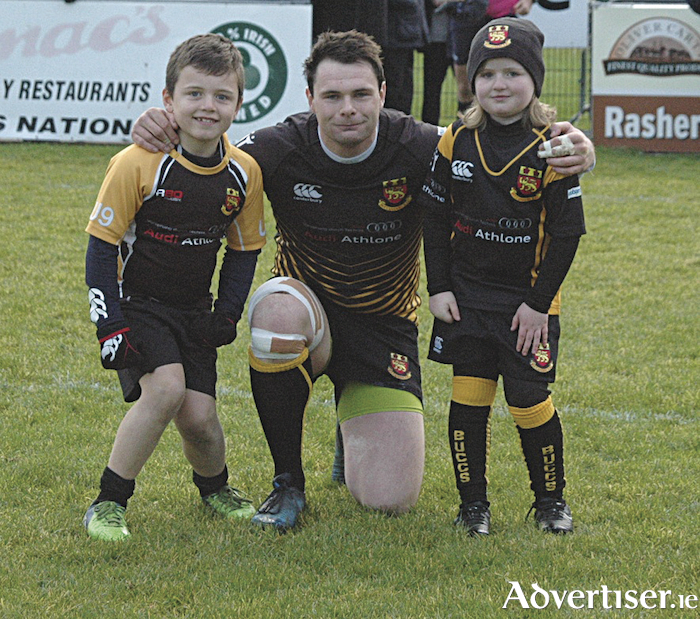 Despite being cold, conditions were near perfect for the game, sponsored by Russell Brennan Keane, which was played with some fervour in front of a decent and vocal attendance. St Mary’s opened at a tempo that was lacking at Templeville Road last week. Buccs were depleted on this occasion, particularly in their forwards unit. Injury in the away game ruled out Simon Meagher, while Paul Boyle, Conan O’Donnell, Conor Kenny and Conor McKeon were flying with Connacht Eagles. Niall Farrelly, Ruairi Byrne and Ryan O’Meara, the latter out of position at number eight, were drafted into the pack, with Graham Lynch operating at scrum-half. Lock Peter Claffey was also unavailable. The first promising move of the match came after eight minutes and fell Buccs' way. A block by Cian Romaine led to the swift movement of the ball across the field to Shane Layden, who made a strong carry to link up with Alan Gaughan, and his pass sent Darragh Corbett scurrying up the right flank, but the move came to nothing. Soon after, Terry Kennedy and Marcus O’Driscoll combined for St Mary's, but they were held up short of the home line. However, the visitors’ forward power earned the first score after 14 minutes. A terrific maul saw them drive over the home line, where Caelen Sweeney-Doris clearly grounded the ball near the posts, although referee Paul Haycock peculiarly signalled it as a penalty try. Buccs stemmed the St Mary’s tide after a period of fierce pressure, and Layden and Gaughan again threatened, but the final pass squirmed away from Corbett. Buccs had worked their way back into the game, and Luke Carty opened their account with a 26th minute penalty. The midlanders enjoyed their best spell in this period with some good work, including a soaring leap and catch by Rory O’Connor, and a splendid Gaughan tackle on USA international Tim Maupin, which yielded a penalty that Carty punted to the left touch. An impressive maul followed, leading to another successful place-kick five minutes later to leave just a single point between the teams. College’s Hugh Kelleher was sin binned for conceding that penalty, but it was St Mary’s who got the next brace of scores. Fullback Kennedy again got close to the home line, where solid defending earned a relieving penalty. However, Buccs pack infringed at a scrum despite having a player advantage, and Kearns drilled over a super 37th minute penalty. Then in the final move of the half, a number of Buccs players were hesitant in defence and fullback Kennedy took full advantage to score an unconverted try wide on the left for a 15-6 half-time lead. St Mary’s were content to kick for territory in the third quarter as the home side’s patchwork pack found it difficult to make ground. Chances were at a premium in the second half, with Callum Boland, Dan Law, Evan Galvin and Byrne doing some notable defensive work for the hosts. Kearns missed a straight-forward penalty on the hour mark, while six minutes later Carty was off-target with a long-range effort for Buccaneers. With College having more options off the bench, they looked the more likely to add to their tally in the closing stages. Just as they had done in the first half, the home side conceded a soft late try. Corbett should have opted for the safety of touch following an angled teasing kick by the metropolitans but endeavoured to play the ball infield, where St Mary’s arrived like a swarm and possession was pilfered from Romaine, with Myles Carey applying the finish for an opportunist try at the posts. Conor Dean’s conversion completed the merited 22-6 win for St Mary’s, which sees them edge above Dublin University. Defeat ensures Buccaneers prop up the league table for the festive break. The Athlone side battled bravely and willingly, but this was their weakest display of the campaign. The absence of so many players was a burden they could not carry. They will get a brief respite to recharge their batteries before they head to Cork Constitution on January 6. Page generated in 0.1035 seconds.